You are here: Home / 2018 / August / 20 / What is your silent piece? 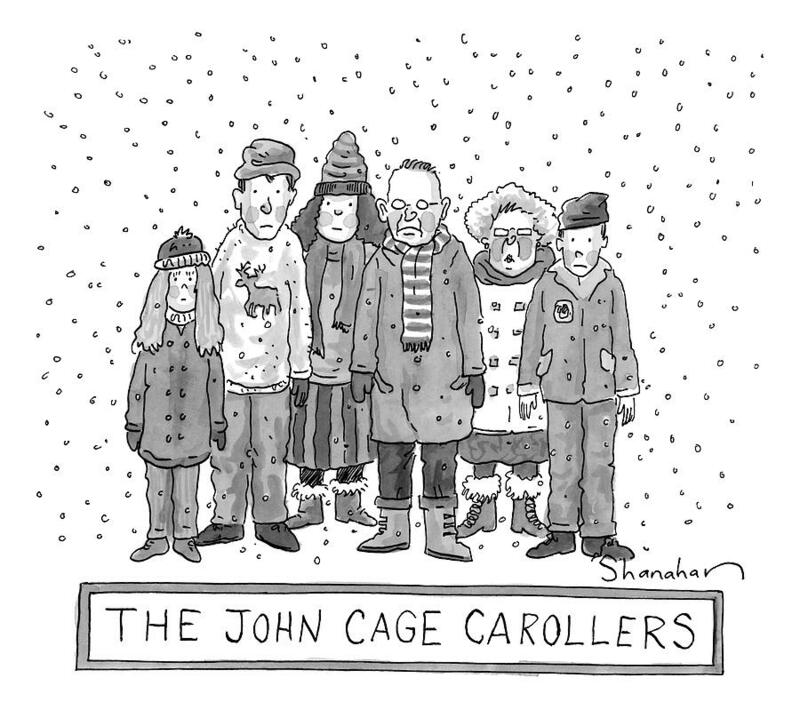 There is no doubt that John Cage’s silent piece is his most famous and enduring creation. Probably each one of you reading this knows (at the very least) that it exists, that John Cage wrote a piece of music that was nothing but silence. You might know more about it. You might know that it was about four and a half minutes of silence, and that its title was 4′ 33″ (“four minutes and thirty-three seconds”). You might know that, in performance, the pianist just sits at the keyboard and doesn’t make a sound. You might know that it isn’t just for piano, that any musicians can play it. You might know that it changed music forever. You might know that it was considered a joke, an avant-garde stunt; or, perhaps, you know that it is a joke, an avant-garde stunt. Once, when I told an artist friend that I was working on a lecture about Cage’s silent piece, he told me that he knew exactly why Cage had written the piece. “It was a response to the dropping of the atomic bomb,” he said, as if this was completely self-evident. This connection had never occurred to me; I was not aware of any statement that Cage made that connected 4′ 33″ to Hiroshima and Nagasaki. It seemed like something pulled out of thin air, but my friend was so certain about it, and so certain that is was Cage’s actual motivation for writing the piece. I didn’t say anything, but inwardly I thought: “that’s his 4′ 33″, not Cage’s”. The point is that each of us has an image of John Cage’s silent piece, an idea—or many ideas—of what he created, why he created it, and what it means. What is your silent piece? And have you really thought about where those ideas came from? Are they Cage’s ideas, or are they yours, or did you get them from somewhere else? Kyle Gann, in his book No such thing as silence, summarizes some of the most common ways of considering 4′ 33″. Is it a hoax? A joke? A bit of Dada? A piece of theater? A thought experiment? A kind of apotheosis of twentieth-century music? An example of Zen practice? An attempt to change basic human behavior? Gann goes through each of these eight possibilities and elaborates on what they might mean. It turns out that he has presented them in order of his increasing agreement with them. He dismisses the first two, then gradually warms to the rest, leaving the last two—Zen practice and behavior change—for extended consideration later in his book. When I actually look at his writings, lectures, and interviews, though, I find it striking that it is nearly impossible to pin any of these meanings on Cage himself. Naturally he never said it was a hoax or a joke, but he also never discussed 4′ 33″ as Dada, as theater, as a thought experiment, as the “apotheosis of twentieth-century music”, or as an example of Zen practice. He made remarks indicating that he wanted to make a point about silence, intention, and self, and in a pinch I suppose you could say that this was “an attempt to change basic human behavior”, but to my knowledge Cage never said outright that he wrote this piece in order to change anybody (not even himself). Beyond this, all of these stories have left me unsatisfied because they don’t ring true to my understanding of John Cage as a composer. 4′ 33″, the silent piece that David Tudor premiered in 1952, has always bothered me in this way. It stands apart from the rest of Cage’s work because it seems so freighted with outside meaning, agendas, points to be made. I can think of no other work of Cage’s, and certainly no other work from the period around 1952, that is so didactic, that appears to rely on concepts and ideas for even its most basic understanding. Cage was a composer who created musical works and then went to the trouble to have them performed in order to find out what they would sound like. He had a curiosity about the world of sound, and composed music in order to listen to combinations of sound that he had never heard before. He could listen to the silence around him at any time, and did so often, with enjoyment, so creating a silent piece just for this purpose seems redundant. I can think of no other piece from this period in Cage’s career that makes me ask the question: What’s the point of composing this? I have struggled with finding a way to consider 4′ 33″ as a piece of music that John Cage composed—not because I have a hard time considering it as a piece of music, but because I have never been able to imagine John Cage composing it. This series will be my story of Cage’s silent piece. My struggle with it has led me to consider more deeply the piece in the context of Cage’s life. So this will be my story about John Cage, about how he came to create a silent piece, what happened to him and to the piece once he created it. It will be my attempt to understand John Cage’s silent piece, not somebody else’s. My storytelling takes as its starting point the documentary evidence about the piece and what Cage said about it and did with it. If I am at all successful, it will be a story in which the main character—John Cage—makes sense. You may have noticed that I seem to be using 4′ 33″ and “silent piece” interchangeably. This is a misperception: for me, and in this series, they are not the same thing. This is a subtle point that I will develop more as the series goes on, but which is critical to the understanding of my story. Cage himself suggested this distinction, and he himself blurred it. He wrote remarkably little about 4′ 33″—almost nothing at all, really. He talked about it when asked in interviews, but most of the time his answers referenced “my silent piece”, not naming the specific composition. Many of these statements clearly refer to a more general attitude towards silence. Common usage has followed Cage’s lead, and today 4′ 33″ and “Cage’s silent piece” amount to the same thing; often both are just labels applied to statements about a general conception of silence itself. But 4′ 33″, composed in 1952, was only one of Cage’s silent pieces. There are three others: Silent prayer (described in 1948, but never realized), 0′ 00″ (1962), and One3 (1989). Each of these four pieces was identified by Cage as being silent through its title or subtitle. When Cage talked about “my silent piece”, which one did he mean? Or did he mean all four? Or are these four pieces all variants of a single silent piece? We might consider that there was one piece that was rethought and reimagined over a period of forty years. Is that how Cage thought of it? The fact that there are four silent pieces is not often realized, but it can alter our personal understanding of 4′ 33″. For my story, there are three distinctly different things: 4′ 33″, silence, and the silent piece. The first is the composition of 1952, a work that was performed in concerts at Woodstock and Carnegie Hall and which, like it or not, has become a part of the Western musical canon. Silence is both an acoustic phenomenon (the material stuff of which 4′ 33″ is made) and, as a synonym for emptiness, a spiritual one. And lastly, there is the silent piece: an emblem of how to create from a place of emptiness. The silent piece represents the silencing of intention, self, and ego as it relates to the creative act of composition. The idea of a single “silent piece” underlying 4′ 33″ and the other three silent compositions is a way for us to consider this general idea, which I refer to as “compositional silence.” Cage made his first public statements about this idea of compositional silence—his first statements about silence of any kind, actually—in a lecture in 1948. And as this lecture also happens to be the first appearance of the silent piece, it is where my story will begin. I wrote hardly anything about 4′ 33″ in my book, The music of John Cage (Cambridge University Press, 1993). In recent years, I have been trying to make up for lost time by thinking about it a lot. In 2008 I was asked to write an essay for an exhibition of John Cage’s work at the Museu d’Art Contemporani, Barcelona (MACBA). I took the opportunity to write “What silence taught John Cage: The story of 4′ 33″“. This was my first attempt to deal with the problems I have with that piece and featured its spiritual dimension (this work later expanded into my series on Cage’s spiritual path, “Opening the door into emptiness”). In 2012—the Cage centenary year—I received a few other invitations, for which I turned again to Cage and silence. I wrote a short piece for the journal Cine qua non called “Five statements on silence by John Cage: Questions, hypotheses, second thoughts”. This got me thinking about many of the ideas to be explored in this series. Also in 2012, I was invited to give a lecture at the Fundación Proa in Buenos Aires, and I decided to speak on “John Cage’s silent piece(s).” This lecture evolved as I gave it in different places over the next couple of years (Barcelona, Philadelphia, Seattle). I just extemporized from notes, but always meant to shape it into a proper essay or set of essays: hence this series. In writing from my lecture notes, I found myself getting more new ideas; I’m clearly not done with 4′ 33″ yet. I can’t pretend to have read all the literature on 4′ 33″—or even a lot of it. Much of it is a kind of critical writing that, frankly, I just don’t understand. Fortunately, we have Kyle Gann’s No such thing as silence (Yale University Press, 2010), which tells the story in a thorough, readable way. Re-reading it reminded me of the overall terrain here when writing this introduction. The quotation from Douglas Kahn is taken from his “John Cage: silence and silencing” from The musical quarterly (Winter 1997). Great stuff — and certainly timely. For me (“my 4’33”) the piece is a call to action — to listen (really pay attention) to the world around us — and all the sounds in that world. In other words, the piece points away from itself, and so is a “prank” on the idea of the typical classical music concert, where we attend only to the stage and regard every other sound as extraneous.